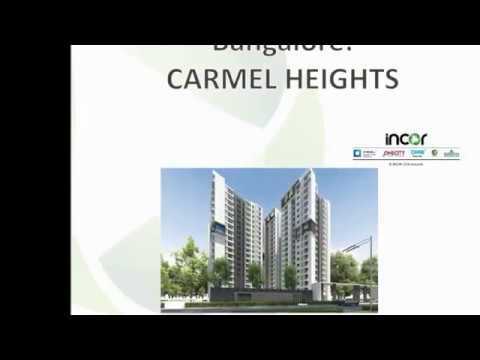 Incor Carmel Heights, a latest residential project of Incor developer, is coming up one of the Bangalore’s hottest destinations- Whitefield which markes to Bangalore as IT city in the country. The property destination is next to the Forum Neighbourhood Mall. It is offering premium residences within the various dimension, the offer will be in type of 2, 2.5, 3 and 4 BHK size. To offer such residences, the property is spanning within 4 acres gated community with premium apartments units (400) size ranging 1350 to 3436 sq ft. configuration. Each infrastructure will be in the configuration of G+18 floor, 3 blocks with basement. Incor Carmel Whitefield Bangalore is best project is all aspect that includes the this, so that age could marked as only number. Every age group will get conducive environment inside the property’s peripheri. Reflexology Park and aromatic synergy garden with yoga garden, make a perfect environment inside the Incor Carmel Heights residential project. With provision for offering 75% open space, the project is creating natural atmosphere in the high tense working lifestyle. The property is best in all aspects, it got better specification, superb location map and international based master plan with floor plan. With including premium amenities, project got ultra luxury features such as gym, outdoor games, running track, garden and others necessities. Every home inside the Incor Carmel Height has planned with vastu shastra keeping into mind, no one home door in the south. The housing project got wonderful brilliant layout for the master plan, each of design has been created perfectly to offer grand features. A big entrance gate will be in each tower along with exit gate. Incor group offers features regarding to outdoor games like Half Basketball court is with Amphitheatre. Moreover outdoor gym, residential drop off, clubhouse drop off, giant chess, old folk’s area, scroll walkway, reflexology walkway, cricket nets, swimming pool, party lawn, waterbody/fountain, barbeque deck, leisure pavilion, jogging track and much more social amenities are available under the Incor Carmel Heights Master Plan. Incor Carmel Heights includes ultra luxury apartments with including clubhouse as well as basic amenities which you deserve in Bangalore. Three towers are planned in the property periphery along with upper proactive terrace & basement. Multilevel car parking region will offer facility for car parking and other utilities. Despite ramp to the basement, it will be connected to ground via ramp. Moreover, pedestrian friendly path is provided to get walk smoothly. World class security system has been allocated to the property, under which CCTV monitoring at each region of apartment and intercom come.